It may only be the conclusion of one expert, but it makes a change from the usual tidal wave of evidence-light negative assertions about the potential future of our Earth. He said it was ‘extremely difficult’ to find a correlation between carbon dioxide levels and temperature trends. British winters will be slightly warmer but there will be no change in summer, Terence Mills, Professor of Applied Statistics at Loughborough University, said in a paper published by the Global Warming Policy Foundation. He found that the average temperature had fluctuated over the past 160 years, with long periods of cooling after decades of warming. Dr Mills said scientists who argued that global warming was an acute risk to the planet tended to focus on the period from 1975-98, when the temperature rose by about 0.5C. He used simple statistical methods, normally used to predict economic trends, to forecast future temperatures. He took into account all the fluctuations in the temperature since 1850 and found no evidence to support the increase predicted by the Intergovernmental Panel on Climate Change (IPCC), a UN scientific body. He found the average winter temperature in central England, which has the world’s longest temperature records going back to 1659, had increased by about 1C over 350 years. Based on that change, he forecast an additional increase of about 0.25C by 2100. He said the average temperature would continue to be “buffeted about by big shocks” caused by natural events, such as the El Niño weather phenomenon. He said that his analysis, unlike computer models used by the IPCC to forecast climate change, did not include assumptions about the rate of warming caused by rising emissions. “It’s extremely difficult to isolate a relationship between temperatures and carbon dioxide emissions,” he said. The pity of it is that the AGW movement is not susceptible to rational argument based on evidence. Its based on a belief system. When teachers in schools refuse to follow the curriculum we might see change. This is what happens when a real statistician analyses climate data. Just like Professor Wegman’s criticism of Mann’s “Hockey Stick”. Not to mention Steve McIntyre’s impaling of much of climate “science”. Data manipulation is distorting the true picture these days. This isn’t an isolated incident, as the NOAA’s antics have shown. It’s not just “the AGW movement”. It’s “skeptics” alike. It’s encouraging to see more people realizing that we’re dealing with a religious phenomenon. Is it even sensible to try to convert rather than to respect differences? Say I present a random person on the street with the proven fact 1+1=2 and suggest that therefore the random person should convert religions. Like what are the odds of that working?? You see this is what convinces me that wuwt works for the “other side”. All they do is ridicule the truth (the sun runs terrestrial climate) to undermine belief in the truth — to make people too timid to dare state the truth. It’s a form of religious intimidation. It’s extremely disrespectful. It not only tries to enforce that people cannot have their own beliefs. It goes even further to assert that there should exist brutal thought police (a merciless harassing force) to ENSURE that people should not hold rational beliefs. This suggests to me that they decided that winning the religious war required that they attempt to crush the spirit of people holding rational beliefs. This group has been bought and assigned a critical mission (in the religious sense). Some have mused about what could break the deadlock in the climate discussion. 1. The climate discussion would be altered fundamentally if wuwt disappeared or was eclipsed. 2. If wuwt persists for 2 decades, the climate discussion will remain stagnant, boring, & gridlocked for 2 decades. When approached on the street by the pamphlet-holding wuwt disciple I say “It’s the sun.” They’re not able to respect the response, so they harass. That’s not acceptable. I’m free to hold rational beliefs and these disciples have no authority to try to rudely coerce me into holding irrational beliefs that 1+1 does not equal 2. I suggest people be less timid. Just say “It’s the sun” and if the agents belligerently persist with unrelenting harassment, maybe just maybe you’re justified in just telling them to please **** off. You don’t need to tolerate irrational harassment. It’s the sun. We all know that and nothing can change it. ‘a familiar ploy in the literature’ – including IPCC reports presumably. Re your notion that:1. The climate discussion would be altered fundamentally if wuwt disappeared or was eclipsed. I don’t see much on wuwt, and especially in comments, but froth and bubble and people attempting to be witty. Tim Ball of recent times adds useful information based on his observations over a lifetime in the field. Lets face it, the climate discussion, even in academic circles is rarely about cause and effect.The so called ‘science’ is strong on mathematical and statistical analysis and weak on the physics of the atmosphere. So, some proportion of the variation in one thing is attributed to the variation in some other thing…without any notion of how that could come to be. Its primitive stuff. I would suggest rather that the physics is dead simple and there’s nothing mysterious about it. The problem rather is that the “mathematical and statistical analysis” is being applied with insufficient awareness of geometry, topology, & aggregation criteria. In simple terms: Stuff moves, but they aggregate as if it doesn’t. No matter the physical apparatus, you get a different spatial pattern if you change the geometry. Let’s be real. It’s to a point now where generations will have to pass before we can get people to be sensible about any of this, so effectively in the shorter term it will have to be dealt with as a social &/or religious issue. No matter the physical apparatus, you get a different spatiotemporal pattern if you change the geometry. Those are the BIG shifts in climate. They relate to GEOMETRY. Erl, if you have any influence with Jo & David, could you ask them when they’re going to extend their exploration to the spatial dimensions? It looks to me like they assume uniformity in all of their solar-terrestrial explorations, but they’re smart people so surely they’ve paused to think about this. It makes me think maybe they missed some of Jean Dickey’s work when they look to the sun and physics for the source of their lag rather than concede simple geometry. I don’t suspect them of deliberate distortion. I’m genuinely puzzled by their (implicit) uniformity assumption. I mean it doesn’t pass even the glance test: we know everything isn’t uniformly synchronized. I’m inclined to suspect there’s some kind of monstrous miscommunication at play in this misunderstanding. I don’t know what to do about it. Maybe someone else does. It is even weaker on evidence, quality evidence. What Bill Illis’ ‘classic’ clearly shows is that chaos rules. Mathematics and physics (and a whole range of cults on climate dogma) aren’t the only aspects worth considering. Other aspects such as the archaeology of humanity (since we are not interested in the history of long lived species such as the cockroach but our mode of survival) are also important. To insure that our short twig on the evolution tree can survive. 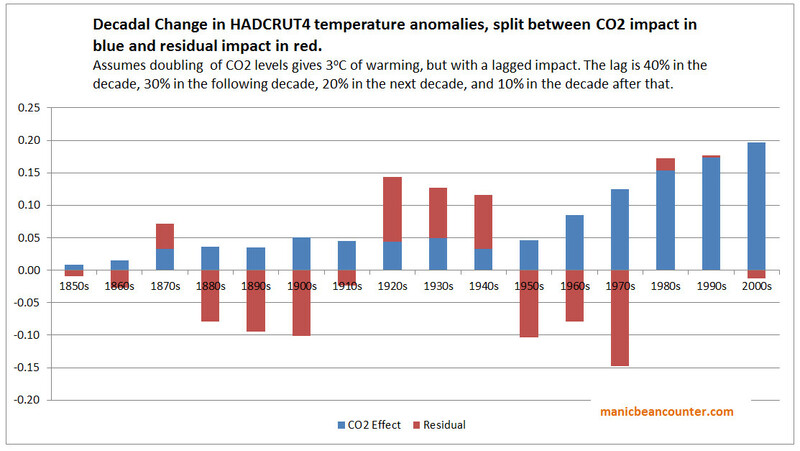 Last year, for a comment, I roughly compare decadal warming using HADCRUT4 with the implied temperature rise from the CO2 rise assuming a doubling of CO2. Using a very crude lag, for the last 3 full decades (1980s, 1990s, 2000s) I account for nearly all the warming. So are climate alarmists right after all? Just three minor problems, that tend to get overlooked. 1. For the previous 13 decades there is no relationship. 2. In 2010 you end up with >0.2C of warming. No sign yet. 3. CO2 is not the only greenhouse gas, only accounting for half to two-thirds of the alleged forcing. Water vapour is way ahead of CO2. Your chart doesn’t show it. Decline in surface pressure affects all latitudes south of 50° south. Depending on which definition of chaos you’re using and if you’re talking about plate tectonics then ok or maybe. Med-Tethys, Panama, Drake open/close led to discrete (step) climate changes. I think its pretty d*mn cool. It just blows the usual discussions away — and its just about geometry. Without the boundary conditions well-defined, what’s the utility of the “physics”? Maybe just to speculate about the climate under some other geometry than what exists. Useful? Maybe, but not as useful as possible. I appreciate your various notes about archaeology. Please keep them coming. Open our eyes further on an ongoing basis maybe. The variety in the discussion is awesome, just like harmony. TB’s extremely wise to emphasize harmony. Just think of how much more enjoyable the various climate discussion venues could be without all the endless (total ***ing waste-of-time) arguing. It would be wonderful if different people would just come and volunteer all kinds of interesting and stimulating info — just dropping notes harmoniously to enrich the scene. Of course there are times to fight too, but if fighting is all that’s going on that’s a lack of due restraint and we’d all nuke each other to death if that unfolded to its natural end. There has to be balance and due restraint and that’s what TB understands that other venue-masters do NOT. Good work TB. You’re the master at that — and AW & JC need a ****ing schooling. Erl, at centennial timescale that looks like the sunspot integral. The worst offenders are the people who look at it as a strictly temporal problem. They completely destroy the discussion. They’re in a fantasy land divorced from spatial reality. With 100% perfect understanding of the physics, the interannual variations could not be modeled without the boundary conditions …but there are an awful lot of people involved in the climate discussion who pretend otherwise. They make me suspicious. One example is worth a few more sentences: The QBO in ENSO. QBO distorts ENSO. It isn’t “part” of ENSO. I think this has put a lot of explorers off track. They take the view that QBO is the major “component” of ENSO. That’s what’s going wrong. QBO is QBO. When it moves down into the troposphere, it touches ENSO and moves it quite far …but it isn’t ENSO. I think the general thinking on this sort of stuff is in some universe maybe not-even-parallel to the one we’re in and certainly that sort of angling is beyond correction. People will do all that sort of stuff for entertainment and I think it’s interesting to look at what they’re doing because it motivates interest in nature and further exploration of the patterns in nature regardless of success or failure. Loving nature is good and discouraging that is bad. Please keep enriching us with your insights. The more concise you are, the more you get through to me. (Others may be different I acknowledge and respect.) Whenever you have time for the soundbite version of your write-ups, I’m likely to be naturally quite curious. Long articles like Tisdale has been doing lately for example — I don’t even look or I just ski (skim & skip), mostly just scanning the graphs for anything eye-catching …and lately there’s nothing. It’s all gotten too administrative and there’s nothing for the explorer. It’s not even succeeding in giving good administrative content; rather it’s just fitting the administrative-looking cookie cutter …as if that’s the end goal!!! Kind of stupid really, but these people think that accomplishes something political …but it doesn’t do anything except try to look official while totally striking out on content. We need rebirth and revival and that stuff is just heading towards death. It’s not interesting. It’s not inspiring. It won’t motivate any interesting discoveries. It’s dry and dull. Why are they pushing that type of formatting?? It’s just bad decision making. It’s short-sighted and in the long-run that will be very clear. I think you have a natural *spark* and you can do much better (lightning-wise) than what they’re doing over there. If you really want to crack interannual variations, you can’t skip phi. Phi is the aggregation key. No matter how far you take your understanding of the physics (more like “physics” with all the sh*tty assumptions (especially about geometry!) they lazily & unrealistically build into it to make the math tractable), you’ll never be anywhere with ENSO modeling (for example) without phi-aware aggregation. I’ll be watching for whatever lightning bolts you throw at the Talkshop. Please feel more than welcome to surprise us with something that motivates the next big discovery. Since PV seems to approve (ty) I’ll add some more to the above, in line with PV’s comments. Take the Bill Illis’ ‘classic’. The last 1M years are really a “mass of blue”, The clear indication is one of great variability with sudden changes. PV accepts discreet step changes in climate, related to tectonic events. However these are normally associated with events far-away in time. But here the archaeological tell-tales indicate otherwise. Changes appear to have been taking place more frequently than previously thought, with a resulting effect on climate that resulted in great human upheaval (which is the crux of all the climate concern). Erl happ said ” warming is a winter phenomenon. And that’s all beneficial”. Not quite. Not when your home country becomes a Sahara (and especially if that sahara is today’s world bread-basket). One in not going to see that, or its onset, on a decade basis, from some proxy, but it has happened. CO2, (or some other) appears to be a common/favorite scape-goat with the GW establishment, but is it? One has to look at all the points of view. Ancient history, though much maligned in the past, offers an interesting perspective. Zooming in on “mass of blue” reveals Milankovitch. Please keep linking us to concisely-framed archaeological insights you think will strategically destroy our ignorance. Time is a never-ending issue for me, so I may not get to it right away, but please be well-aware that my mind is open and may be in more agreement with your perspective than you realize. It’s possible my past silence on the file has created misleading optics about what I think. I do remember something about Dodwell (vaguely) & Rubincam (more clearly) and I’m clear on climate friction, but I’ve not yet seen the distillation on the Dodwell file that hooks my curiosity like lightning. What I remember thinking is “looks like there may be something there but I don’t have time to figure out what isn’t being conveyed with sufficient terseness“. People kept linking to the Dodwell discussion so it was clear they were captivated by it, but no matter how many times I scanned it I remained at “looks like there may be something there but I don’t have time to figure out what isn’t being conveyed with sufficient terseness“. The more concise the better. A single image is best. I’ll be watching with an open mind for the efficient framing that gets through with one concise image. Please assume deep ignorance of archaeology as a starting point and be assured that links to long articles will not help (due to harsh time constraints). There could be some exceptions to that generalization, like if the article is superbly luminary and captivating. Paul V , I’ll try to answer tersely as you wish. And try to keep within the subject-matter. But you know from your own sometimes lengthy posts that full explanations may need be long-winded. You say the mass of blue reveals Milankovitch. Possibly, but I would question it as a dictating force (for one thing the earth orbit eccentricity is here on the low side). Besides the mass reveals a host of other more closely spaced occurrences. Literature on Milankovitch points to the earth’s axial tilt as a ‘key player’ among the variables. And here then it was assumed that obliquity did not vary beyond the 25 to 22 deg. This is where Dodwell threw a big spanner in the works. If obliquity varied down beyond 22deg then the Milankovitch effect is only a minor variable superimposed on something else more powerful in dictating earth’s climate, (and much else). Dodwell’s work was questioned>not accepted>sidelined>discarded. Dodwell pointed to a sudden obliquity change in 2345 bce. It so happens that from two millennia before that, someone had devised a solar calendar that functioned by following the sunrise point on the horizon. The method or design used evolved over the centuries and during that time and in its final stages showed, first the unmistakable intention, and also an understanding of the optics of the ‘eye’ and a mathematical/geometrical ingenuity throughout the design, that in no way can it be construed as accidental and by chance. It is not a singular instance but has occurred in stages over several calendar units. In following the rising sun from equinox to solstice the angle traversed is the obliquity angle as applicable at the particular latitude. That angle can be read from a number of units. For a good stretch of time it was less than the minimum 22deg, more like 14.5deg. Somewhere between 2900 and 2000bce one unique unit still incorporates an alteration to a 24deg obliquity. So today there are two later design calendars, one obsolete and still set at ~14.5deg obliquity, one incorporating the alteration from 14.5 to 24 (and still functional, but I have yet to test a scaled down replica. I tested an early model and it works fine). So there is archaeological evidence that vindicates Dodwell and shows that the Milankovitch aspects are not the main dictators on climate, and to some extent flawed. I would add that one should review how the assertion of a 22-25 deg obliquity limitation with a mean for epsilon as at 1850 came about, with never a transient jump, but I leave it at that. You are right to point to water vapour as a GHG. However, my approach is to replicate the CO2 warming hypothesis, to see how it stacks up. It would be truly impressive if a simple hypothesis of CO2 being the main driver of temperature variation – with water vapour a follower. If it were the data would show it. oldmanK, 400k & 100k eccentricity and precession-scale Milankovitch are crystal clear. Do you agree? If not then maybe the first obstacle we have in discussing obliquity is a monstrous perceptual difference. Also, you’re (apparently?) assuming I have background on Dodwell and conflicting mainstream conceptualization of obliquity changes that I do not have. Visuals? I need visuals. If you don’t have them, I will respect that, but our exchange will be stalled. PV, two quick outright answers. Yes we have a perceptual difference discussing obliquity, mainly because I have first approached this subject as a sceptic; as one already exposed to contrary evidence. The ‘fixation’ on only obliquity arises from the fact that obliquity is the only seasonal evidence of the earth’s tilt that can be used in practical ways to mark/measure time and season. Precession and eccentricity are mental concepts of the secular behaviour of the planet, but that no one observes in one’s lifetime. In fact the visual effects of obliquity have been used (in an archaeological context) to create an efficient calendar, thereby also inadvertently recording for posterity what that tilt angle was. Like many others I had unquestionably accepted what is said of obliquity and how its limited to a small 22-25 deg variation. The first reaction was doubt in one’s self. And that is where Dodwell comes in. Find archaeo visual here (provided admin allows). At latitude 35.8deg, 18 deg corresponds to~14.5 obliquity; 29deg to ~24deg obliquity. oldbrew has posted before my reply. The 3194 or 3195 date may cause confusion. In my visual 3195bce is obtained from dendrochronology, marking a period of widespread minimal tree-ring growth. It also coincides with major destruction and abandonment of several sites dated tentatively by C14. Has climate changed the Earth’s tilt? PV> I’ve been through them all before. The more interesting one is the first link by Rubincam and the most recent (these papers have a habit of overturning each other every few months). Interesting because it is based on recent observations of the geology of Mars (the paper is a spin-off from that research). Even more so because the ‘feedback process’ described/hypothesised matches exactly what I have observed in the evolution of the ancient calendars, something I saw at first as a major anomaly. oldmanK: the 3194 is a mis-print by Dodwell and should say 4194, which is the elapsed time between 2345 BC and 1850 AD. oldbrew: agreed. The 3195bce date I quote in the visual is not related or sourced from Dodwell. 3200-3000bce was a very eventful era replete with instances of cataclysmic type terminations and changes. Dendrochronology gives/indicates a more precise date. Dodwell’s work was replicated by others working from basic data and came up with basically similar conclusions. That there is an unknown factor in obliquity, with possibly far-reaching implications on any climate considerations. Hence the importance I place on the historical aspect. Do you have this documented in a graph? Or concisely some other way? Have you shared it with the earth orientation parameter experts? Dodwell may well have strategically provoked. One thing I think you might be wise to do on the trust-earning front: Point out exactly where Dodwell was most seriously wrong. Even just 2 sentences should do it. Bear in mind that none of this implies spatiotemporal chaos at all scales. There are bounds on the geometry-related volatility. The system is only free to deviate finitely from the attractor. Steps are exceptions to such generalization, but even there there may be some as-yet unidentified attracting structure at a higher level of organization that presently remains wholly or partially within our sphere of ignorance. Until we understand plate tectonics better, it’s tempting to look at it towards the way we look at massive impacts realigning the axis, but my instincts based on the multivariate geophysical explorations I’ve done to date suggest this would be a mistake. I believe plate tectonics is NOT independent of the wind field. Observations suggest the plates are coupled to the wind field. People omit the spacing from their time-only views. It’s a really big problem. I’m beyond-suspicious of the people thought-policing that ONLY time-only views should be permitted to discussion. Frankly I find them corrupt. It’s a deliberate tactic to derail sensible (spatially-aware) discussion. They know that if they police the discussion to be time-only, it’s 100% GUARANTEED to be absolutely dead-ended. I could regard this as clever if it was not so malicious. 2,400 BC – The canons of the Chinese emperor say, ‘In the lifetime of Yao, the sun did not set for ten full days and the entire land was flooded (by an immense wave), that reached the sky’. Could 2400 BC be an approximation of 2345 BC – Dodwell’s date for a sudden ‘event’ on Earth? PV above asks “Do you have this documented in a graph? Or concisely some other way?”. It is somewhere in another thread, but I link again; see below. The ‘graph’ is intended to link evidence from disparate sources chronologically. For example for a date 2345bce, said to be an obliquity jump, there is Dodwell’s work, an engineered and functional megalithic structure, a firm date from tree-rings, and a point in the temp anomaly curves indicating onset of polar warming concurrent with equatorial cooling. All agree. This besides a host of other historical material eg oldbrew’s above, of a very curious nature. The graph is not exhaustive. Too long-winded to try here. Continuation of above post: some particular points. There is a series of structures that exhibit evolution of technique, but their curious ratcheting of earth tilt angle seem (and is explained by) a 1+1/2 cycle of the Rubincam feedback process. What for a long time was a serious anomaly changed into a ‘possible’. The obliquity swing at top of graph corresponds to low=~14.5, high=~24+x. 4375bce, 3195 (not shown) and 2345 are very firm dates from dendrochronology. 6200, 4375 and 2345 are point where polar temp increase but equatorial decrease. ‘As I mentioned in my opening, his [Dodwell’s] hypothesis of an earth that had a significantly greater axial tilt than observed today and the fact that there apparently was hard scientific evidence to back this claim up, interested me sufficiently for me to decide to re-analyze his data and conclusions and see if it still stands up to scrutiny even after almost 50 years after his death. @ Paul Vaughan: Re your comment, quote “Dodwell may well have strategically provoked. One thing I think you might be wise to do on the trust-earning front: Point out exactly where Dodwell was most seriously wrong. Even just 2 sentences should do it.” Your comment is very intriguing and you seem to have something particular in mind. Can you be more specific please? There are several (and various) issues where Dodwell could be criticized, but the basic issue based solely on the old measurements is sound. That exercise was replicated by A Wittmann with same results. I have assessed neither Dodwell nor criticisms of Dodwell. I noticed that critics accepted obliquity jolts but were surprised that Dodwell assumed the jolts started from inclination 0. On the surface that looks pretty nutty. I would expect at least some kind of commentary on that. I haven’t even checked to see if the allegation is true, but I would expect commentary on this from anyone having claimed to have been all over the file. For example, if it’s a false allegation, it deserves condemnation and if it’s a true allegation, it demands upfront acknowledgement. A step change is interesting even if someone got the starting point wrong. I would find a step change interesting no matter what the starting point. I’m very curious to see 2 sentences worth of commentary on this from anyone/everyone who has been through the file carefully. At the time, Smith was considered to be an unassailable expert. After she was accused in her stepdaughter’s death, the authorities “made it very clear that there was nobody else out there that was willing to challenge Smith because he was right,” she said. […] the Association in Defence of the Wrongly Convicted […] warned that these types of errors can still happen because the justice system often relies on expert opinions. He also noted that the process of overturning a wrongful conviction is often long and expensive, meaning many people do not end up seeking them. Look at the escalation in framing folks. The discussion has moved to a new level. A lot of yesterday’s climate commentators have nothing to contribute on this new level. …then he’s effectively working to support US Dept. of Commerce international deception (by playing up weak criticisms to make it look like there are no substantive issues being raised, but rather only frivolous challenges). PV tks for the reply. I will try to answer that. But one point first, we differentiate from what is fact, or hypothesis, or speculation. G Dodwell worked on fact–the old direct measurements of obliquity starting from 1100bce (irrespective of their accuracy). Comparing those to Newcomb’s obliquity calculations from earlier work showed discrepancies (proven by A Wittmann). He then came up with a hypothesis. Was the obliquity near or equal to zero, or whatever? That’s speculation. At zero there would be no seasons. Nature is acclimatised to seasons so it couldn’t be, it has been argued. Wrong. That is speculation. Life without seasons where nature is continuously fruitful (at some latitudes), a sort of ‘garden of eden’ (a pun not cult) might be possible (I have a tree that is immune to seasons-produces at every quarter, the weather is benign to it all year). The truth is we do not know how nature would react, only hypothesise on the information at hand. The megalithic calendar at the various sites are nearly all limited to a field of view of ~18deg (measurable). That is fact. At latitude 35.8 that works out to an obliquity of about 14.5 deg and that is according to my hypothesis. In one instance there is evident a change to field of view of ~29deg >> obliquity of ~24 deg at about 4500 years ago. Coincidence? Add to that various stages of evident and surprisingly functional technical evolution. The anomaly was why in 2000years++ of evolution these only to came to the right obliquity at nearly the end, at around 2400bce (in line with Dodwell). Put the two cases together and they reinforce each other. All else I’ve read on this subject goes no further than speculation, some totally off track and unfortunately some of it quite biased. Then there is more supporting evidence, but what you might call circumstantial. PV: Dodwell assumed an increase in tilt but it could have been a decrease, as Gerry Pease mentions here. We may be having a misunderstanding. oldmanK: Can you link to the relevant works by A Wittmann? oldbrew, there is a substantial amount of evidence, but which is all ‘circumstantial’. At some point around ~2345bce obliquity was more than 24deg -fact- because it was measured. The 4TS link is interesting because it was an (excellent) replication of Dodwell’s but based on more recent data using Wittmann and Lieske. Only the megalithic calendar records a ‘before and after’ (a measurable fact); from its initial design to its later modification. It was a step change. There is more (not mentioned earlier in detail), evidence of a previous increase>decrease, an enigma/anomaly because it hinted at cyclic obliquity changes. Seemed crazy. However Rubincam’s paper explained the process of that cyclic change. It is something inherent to the planet (cyclic changes to Iz relative to Ix Iy), without need to invoke extraterrestrial impacts or any such events. Its a long story and the devil of it is in the detail. Mathematically explained, a step change of a dynamic system from one initially stable point (having become unstable) to a higher one, slightly under-damped so as to allow it to go (inertially) beyond the new stable point, to which it then returns slowly through an exponentially decaying correction. Journal: Astronomy and Astrophysics, vol. 73, no. 1-2, Mar. 1979, p. 129-131. Another current thread by Ian Wilson has made reference to a paper by Arbreau (2012). It has an interesting early statement worth remembering. (Please refer also to an earlier post of mine Feb 26 5.03pm second para). Something else is at work (is the internal amplification mechanism same as what is referred to by Rubincam as a positive feedback process?). It seems the Milankovitch “”theory of glaciation”” is only an as yet an ‘unsupported’ hypothesis. That’s just an administraitors trick: toying with the definition of Milankovitch to “unsupport” belief in something observed. Milankovitch is observed. It exists. Fussing over the definition is about refracting social, cultural, & religious optics. “Amplification” is a very clumsy way to ignorantly describe the effect of gradients on flows. It isn’t helpful. Maybe it’s intended to be unhelpful. I’ll take a look at the Wittmann link possibly/probably tomorrow. PV, consider me one of those ragamuffins. I’ve now looked at the linked Wittmann article, but I don’t see the same step-sequence tabulated. @PV: The Wittmann paper provides a table of ‘historically observed obliquity’—which is independent of Dodwell. One can work from that on the lines of Dodwell, by comparing obliquity ‘epsilon’ as historically measured, with the calculated value using any one of the formulas given (I used both Wittmann’s and Lieske). The discrepancy increases as one goes back in time, and the rate of increase is an exponential best-fit. That is, a decaying exponential superimposed on a secular change (polynomial). Wittmann acknowledges that the discrepancy exists and is not yet resolved. At one point (pg 2 1st para) he asserts that it is known that obliquity oscillates between 22.5 and 24.5 . But I ask: on the basis of what? I have tried to find out. The link below was interesting; pg4 sec 3.2 gives a historical background. oldmanK, interesting material. Thank you. Is it clear to me that they have miles to go with their conceptualization? Yes, but at this point in time at least I can’t help them with this stuff. I think it’s helpful that you’re bringing all of this to the community’s attention. It helps reduce naivety. If there’s anything specific you were hoping to accomplish in this exchange that you feel remains a loose end, please feel welcome to specify. If not, please consider your alerts filed away and integrated into broadened awareness, ready to be connected with whatever else whenever occasion arises. I thank you for enriching and broadening the discussion. Be assured that I’ll be monitoring any ongoing tips that you continue sharing in the weeks & months ahead. Regards.